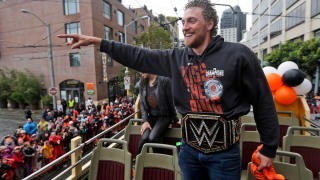 Hunter Pence plays 8-bit video games. Of course he played Pro Wrestling as a kid. Hunter Pence plays old video games. The eccentric San Francisco Giants outfielder proudly showed off his stash of classic Nintendo Entertainment System games to Instagram, McCovey Chronicles noted. Many people in Pence's age group — he was born in 1983, just in time to play the likes of "Tecmo Super Bowl," "Baseball Stars" and "Golf" as a young child — will recognize these cartridges. And, possibly, already be taking deep breaths in preparation to blow on the game in order to get their Nintendo to work. Pence is also claiming that these were HIS old games, rescued from a former abode. So we have an idea of his personality: not too sports-heavy, with all of the classics represented. There's Super Mario Bros. 3 and Megaman 2, widely considered two of the finer video games. There's Tecmo Super Bowl, a favorite of any preteen boy of his era, and — in perhaps an eerie moment of premonition — Baseball Stars. And, fittingly of the man who brought a WWE war cry to Major League Baseball, there's Pro Wrestling. About the only quibble a classic gamer could come up with: No Zelda? ?